Growing up in a small town in southeastern Missouri, I had a lot of down time. With the exception of school and chores, there were few planned activities, leaving great spaces of time to dream, think and draw. Drawing became a escape from boredom to a world of possibilities. I eventually attended art school at Washington University School of Fine Arts in St. Louis, and worked in the fashion industry for a short five year career before retiring to marriage and raising a family. Though I managed to be creative while raising a family, it wasn't until later in life that I finally had the time and a studio space to devote to my creative endeavors. My studio is the place where I can become myself and express myself through my work. Except for foundation courses in Art School, a year in the Illustration Dept. and Continued Ed. Classes at RISD, my painting has been a personal journey. For me, the experience of painting is always the tensions between concept and process. 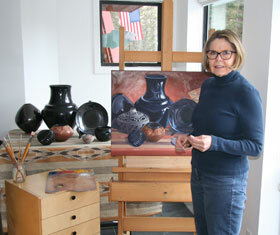 I start each painting with an idea that I work out in sketches to understand the subject through value and composition. I transfer these thoughts to canvas, putting away the sketch and any photo reference I may have started with, and allow that the process to take over. It is the time when the painting demands a certain color, space or line. This happens at different times depending on the painting and during the process my thinking evolves and germinates into what will become the next painting. I often work in series, ie. Window and Tree Series. In working with Still Life's, the process is somewhat different in that I always work with set-ups where most of the painting will be about the careful observation of objects and translating them to a two dimensional surface Nevertheless, I begin with the same sketching and thought process before painting on the canvas. I want to say something about the still life and present it in a way to invite the viewer into the painting. In the end, I believe painting is about the balance between concept and process, idea and intuition, thought and feeling. Rhode Island School of Design, Illustration Dept.& Continuing Ed.